Flat heads for flower in summer in a range of colours from soft pinks to fiery orange and red. Exotic looking plants with large heads of flower and sword-shaped leaves. Excellent in pots as well as the border. Aromatic plants with spires of flower for dry soils in sun or light shade. Late flowering plants including Michaelmas Daisies. Lots of mildew-free varieties. Intricate, but tough flowers ideal for the cottage or natural garden. 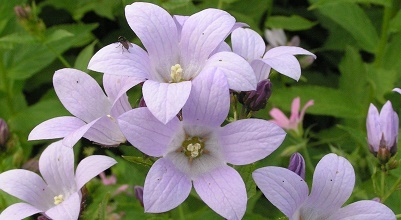 Bellflowers in a wide variety of shapes and sizes for sun or shade. Easy to grow, brightly coloured flowers over a long period in summer. Well-known , growing from corms with sword-shaped leaves for sun / light shade. Sea hollies with spiny leaves and dramatic, spiky flowers. Excellent in well-drained soils. Tall, late bloomers with large heads of flower for most soil conditions including boggy. Wood Asters: previously known as Asters, these are valuable plants for dappled shade that are tolerant of dry soils as well. Great range of size and colours for a wide range of situations and soil types. Lovely early bloomers for sun or light shade. Tolerant of boggy soils. We have probably the largest range of these plants in the country. Brilliant flowers, loved by all beneficial insects. Great in a sunny spot. Tough, long flowering, stout, upright plants for sun or light shade. Inula are wonderful bee and butterfly flowers that do well in most garden soils including quite damp. Korean Asters blooming from mid summer right into autumn. Tough and easy to grow. Well-known as "Red Hot Pokers" but not all are red and many are in softer colours. Shasta Daisies with large, showy flowers through the summer. Ideal for a sunny spot and great survivors in dry soils. Known as "Gayfeather" and great for butterflies. Tough prairie plants for a sunny spot. Perennial plants for late summer flowerer with bright flowers on upright stems. Spires of bee-attracting flowers in late summer. Grows well in dry to wet soils. Tough, non-invasive grasses, with an upright habit and great autumn colours. Also known as Polygonum. 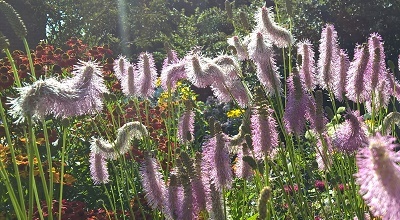 Long blooming plants with spires or drumsticks of flower. Jerusalem Sage with attractive leaves, flowers and seed heads for well-drained soils in sun. Classic cottage garden plants with beautiful fragrant flowers. We have a very large range. Low growing plants with strawberry-like leaves and brightly coloured flowers in sun. Well-know early season flowers great for early flying bees. Best in damp to wet soils. Coneflowers. Bright, late bloomers for sun or light shade. Perennial, ornamental sages with masses of flowers over a long season. Spires flower on tough hardy plants for sun or dappled shade. Good in dry shade. Stately umbels with masses of flower in the summer. Sword-shaped leaves and spikes of satiny flowers throughout the summer. Easy to grow. Close relatives of Centaurea with large pink thistle-flowers from very attractive buds. relative of the scabious with masses of small pom-pom flowers on wiry stems. The American Asters are now officially listed under this mouthful of a name. You can still find them in our Aster section! Fragrant flowers, stately plants to add height to a border. Spires of pretty flowers that are loved by bees. Tall, architecutal plants with branched spires of flower in summer. Loved by bees.